Health and Human Services Secretary Tom Price has apologized for flying on private planes for government and personal business and pledged to reimburse taxpayers for the cost of the flights. Price also said he would continue to cooperate with the Inspector General's probe into his travel procedures and had initiated an official review to determine any necessary changes. "I regret the concerns this has raised regarding the use of taxpayer dollars," Price said in a statement. "All of my political career I've fought for the taxpayers. It is clear to me that in this case, I was not sensitive enough to my concern for the taxpayer. I know as well as anyone that the American people want to know that their hard-earned dollars are being spent wisely by government officials." 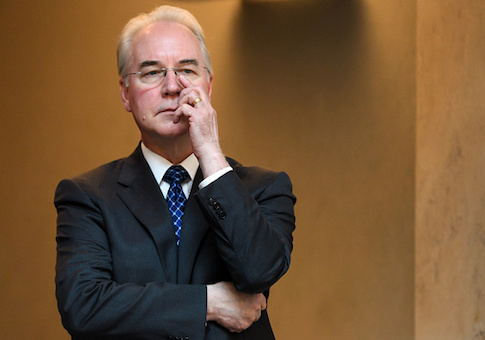 Price pledged to take no further private charter flights while head of HHS and to immediately write a personal check to the U.S. Treasury for his private charter travel. "The taxpayers won't pay a dime for my seat on those planes," he said. President Donald Trump told reporters this week he was "not happy" about Price's travel habits and said "we'll see" when asked if he was considering firing him. Politico reported last week Price had taken at least 24 flights on private jets at a cost of more than $300,000. One trip included a stop at St. Simon's Island, a Georgia resort, a day-and-a-half before addressing a medical conference there. Before being confirmed as HHS Secretary, Price represented Georgia's sixth congressional district. This entry was posted in Politics and tagged Donald Trump, Politico, Tom Price. Bookmark the permalink.